Here’s Why You Should Choose This Ottershaw Garden Cabin for Your Home. The superb design of this ‘Ottershaw’ corner garden log cabin adds a new look to the ‘norm’. With the doors across the corner, it enables the maximum amount of light into the cabin as well as the maximum amount of available wall space inside. These aspects enable the greatest amount of usage to suit all your family’s requirement. If you plan to use it as a recreation room or fitness room, or as a home office, or as a ‘crash room’ for your children and their friend or as a summer room this log cabin will find all those needs. Give some thought to how much use you can get out of this cabin – you will be amazed! And no wasted space in the corner of your garden. The Swedes know the secret of the Nordic timber and is used extensively in their country. The slow-growing nature of this wood makes it ideal for log cabins – being both strong and stable. The ‘Ottershaw’ cabin benefits from this great natural material and which will enable a long life for your new cabin. The design of these ‘Ottershaw’ corner log cabins has a stylish and very attractive classical or contemporary design. I’m sure we can help as we always remember it’s your cabin and should reflect your requirements. The quality of timber used is top notch and you won’t find any cheap or nasty materials in it. Some log cabin suppliers even use chipboard or OSB boards in them which is totally unsuitable. The doors and windows on these Berkshire log cabins have features not available anywhere else. They have added strength from part laminated materials and this reinforces and stops any possible twisting to warping effect. Adjustable hinges make them a joy to hang and to live with. Everything designed for the great British weather. With the double glazed windows as standard, they will make it a joy to be in. All timber naturally comes from renewable resources. These superb ‘Ottershaw’ log cabins can optionally be assembled for you by a third party saving you time and effort. As they do this on a regular basis your new cabin will be up very quickly and importantly correctly. Having said that it’s possible for you to assemble these buildings as everything is done to make it straightforward. The ‘Ottershaw’ log cabins design has been assembled at the factory before being flat-packed and shipped to you. All parts are bar coded for ease of access and by following the log cabin guideline can be assembled efficiently. The secret is to take your time and work through each step one at a time. Want a challenge then there you go! Less Than 2.5m Tall. Eaves Height 2.05m. Included Are Two Opening Windows. Size: This Ottershaw corner log cabin is just under 2.4m x 2.4m (7¾ft x 7¾ft nominal). Note this is the external size of the body of the cabin. The lugs extend 100mm on each corner making the overall size (as most other companies quote) 200m larger. We mention this so you know you are comparing ‘eggs with eggs’. Approximate clear internal size will be approx 2.3m x 2.3m minus the corner bit. Please check with us if internal size is crucial. Cladding: Standard logs are cut from a top grade of Nordic Timber, this ensures the maximum stability and longevity of the timber, on these corner log cabins and are 40mm and interlock into each other. The log profile has designed wind-tight connections to ensure a superior resistance against wind. Untreated. Kiln dried timber from sustainable sources. Floors: 18mm thick T&G untreated boards used on these floors. No chipboard, OSB or other cheap sheet materials used on the floor, unlike some other log cabin UK suppliers. Floor joists are 45x45mm and are normally spaced no more than 650mm apart. All floor joists are pressure treated for long life as standard. Doors: Joinery quality double glazed double doors 1494mm wide x 1736mm high (59in x 68¼in) – approx sizes. Easy adjust hinges complete with gasket seals, fitted silver finish door handles, cylinder lock and two unique keys. Low doors sills giving you easier access into your log cabin. Supplied untreated. Beware of doors with single glazing or excessively high door sills. Windows: Two (2) contemporary style joinery quality inward opening windows included as standard. 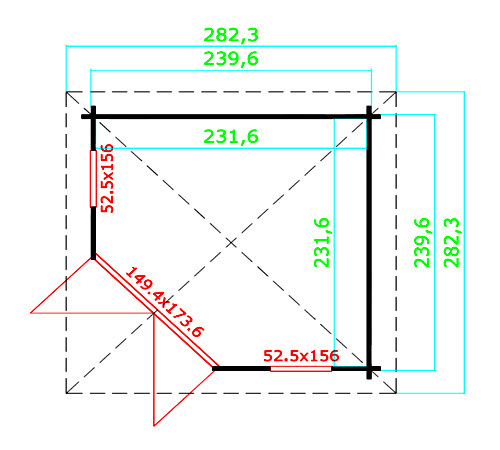 Size of each window is 525cm wide x 156cm high (20½in x 61¼in). Complete with easy adjust hinges, silicon gasket seals and delightful silver finish window handles. Supplied untreated as standard. Double glazed as standard NOT single glazed. 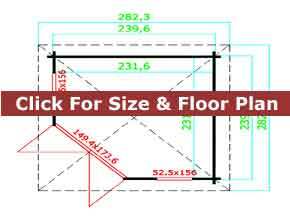 Lower Walls: Height: 205cm (80½n) – on all Ottershaw corner log cabin kits for sale. These Ottershaw Corner log cabins are a supreme answer to that corner spot in your garden. Besides that the contemporary look gives this building a stylish and modern look besides allowing light to flood into these log cabins. Imagine relaxing in this in your garden. Where ever possible take a look at what you are buying. We have a range of Trentan Log Cabins on display for you to inspect, although not always this model. Don’t risk your ‘hard earned’ money on a range of log cabins you can’t see. These Nordic wood cabins are fully double glazed for comfort and under 2.5m tall for planning.